For other uses, see Kielder (disambiguation). Kielder is a small, remote village in western Northumberland, England. Located at the head of Kielder Water and in the north west of Kielder Forest, the village is 3 miles (5 km) from the Scottish border. Early settlement around Kielder Castle, a hunting lodge built by the Duke of Northumberland in 1775. Previous settlements were expanded in the 1950s by the Forestry Commission who constructed housing to accommodate the workers employed in the planting of Kielder Forest. Most of this housing has now been sold back to the private sector. Kielder is in the parliamentary constituency of Hexham. 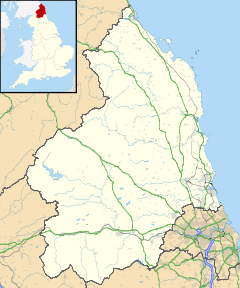 Until 1 April 2009 it was within Tynedale local government district, but following local government restructing in Northumberland the county is now covered by a unitary authority, Northumberland County Council. It is claimed that Kielder has the lowest level of light pollution in England – hence the construction nearby of Kielder Observatory. As with the rest of the British Isles, Kielder experiences a maritime climate with cool summers and mild winters. There is a Met Office weather station at Kielder Castle. Since 1960, reported temperatures have ranged from −21.7 °C (−7.1 °F) in January 1982, up to 30.0 °C (86.0 °F) during August 2003. The population of Kielder in 2001 was 207. The economy of Kielder has relied on forestry but now also incorporates tourism. Prior to the 20th century the economy of Kielder revolved around sheep farming. The use of the area as a hunting ground by the Dukes of Northumberland added an extra element to the area. Due to its location close to the border with Scotland, there was a black economy concerned with the smuggling of whisky from Scotland to England. The Forestry Act 1919 established the Forestry Commission with a purpose of forming a strategic reserve of timber for the country. The first plantings at Kielder were in 1926 when 800 hectares (3 sq mi) of coniferous trees were planted. A further 19,000 hectares (73 sq mi) were purchased in 1932 and today 62,000 hectares (239 sq mi) of forest are under Forestry Commission control. Although timber production remains an integral part of the forestry operation, it also has the aims of encouraging the public to use the forest as an educational resource and to sustain and enhance wildlife conservation. Over 50% of the red squirrel population of England is now found in the forest. With the creation of Kielder Water in 1982 great strides have been taken to develop the area as a tourist destination with the establishment of facilities such as Leaplish Waterside Park by Northumbrian Water, which offers both accommodation and recreational facilities, the Kielder Observatory and various artworks in the landscape, such as the Kielder Skyspace. Kielder was served by Kielder railway station on the Border Counties Railway which linked the Newcastle and Carlisle Railway, near Hexham, with the Border Union Railway at Riccarton Junction. The first section of the route was opened between Hexham and Chollerford in 1858, the remainder opening in 1862. The line was closed to passengers by British Railways in 1956. The station building, now a private house, still stands here by the 'Station Garage'. The station was renamed Kielder Forest in 1948. The Kielder Reservoir now floods much of the route eastwards to Falstone, but a very fine castellated viaduct near Kielder Castle still stands. About half a mile east from here the line is obliterated as its route is now reservoir and some scouring and embankment removal has removed the traces of its course. Slightly further east its course would be below today's water level. The village is served by Kielder Community First School. In the academic year 2009–10 this has a roll of nine pupils aged 4 to 9. Children aged 9 to 13 attend Bellingham Middle School and from 13 to 18, Haydon Bridge High School. As the high school is a considerable distance away the option to board at the school exists. Kielder lies within the Anglican parish of Falstone with Greystead & Thorneyburn. Within the village there are a pub, a shop and sub post office and a YHA youth hostel. ^ "Parish population 2011". Retrieved 25 June 2015. ^ "Observatory boasts darkest skies". BBC. 25 April 2008. Retrieved 1 April 2009. ^ "Kielder Climate". KNMI. Retrieved 7 November 2011. ^ "Kielder & Falstone: Short term housing needs study". Tynedale District Council. May 2007. Archived from the original (pdf) on 21 June 2011. Retrieved 19 May 2009. ^ Grindle, Dean (2005). "Reivers cycle route". Dean Grindle. Retrieved 19 May 2009. ^ a b c d Read, Helen; Frater, Mark (10 June 1999). Woodland Habitats. habitat guides. Jo Wright. Routledge. p. 123. ISBN 978-0-415-18090-0. Retrieved 19 May 2009. ^ "Kielder Water and Forest". Northumberland Tourism Ltd. 2009. Retrieved 19 May 2009. ^ Simpson, David (2006). "North Tynedale". talktalk.net. Retrieved 19 May 2009. ^ "Visit Kielder". Northumbrian Water. 2009. Retrieved 19 May 2009. ^ "Cat Cairn: The Kielder Skyspace". Kielder Art and Architecture. Retrieved 23 January 2019. ^ Sewell, G W M (1991). The North British railway in Northumberland. Braunston, Devon: Merlin Books. p. 71. ISBN 0-86303-613-9. ^ Cromey-Hawke, Nigel (5 March 2009). "Kielder Community First School". Ofsted. Retrieved 19 May 2009. ^ "Boarding at Ridley Hall". Haydon Bridge High School. 22 June 2007. Retrieved 19 May 2009. ^ "A church near you". Church of England. 2008. Retrieved 19 May 2009. Wikimedia Commons has media related to Kielder, Northumberland. This page was last edited on 29 January 2019, at 00:50 (UTC).